An easy, flexible and full of responsive and mobile first features, made for designers, CSS Grid System. 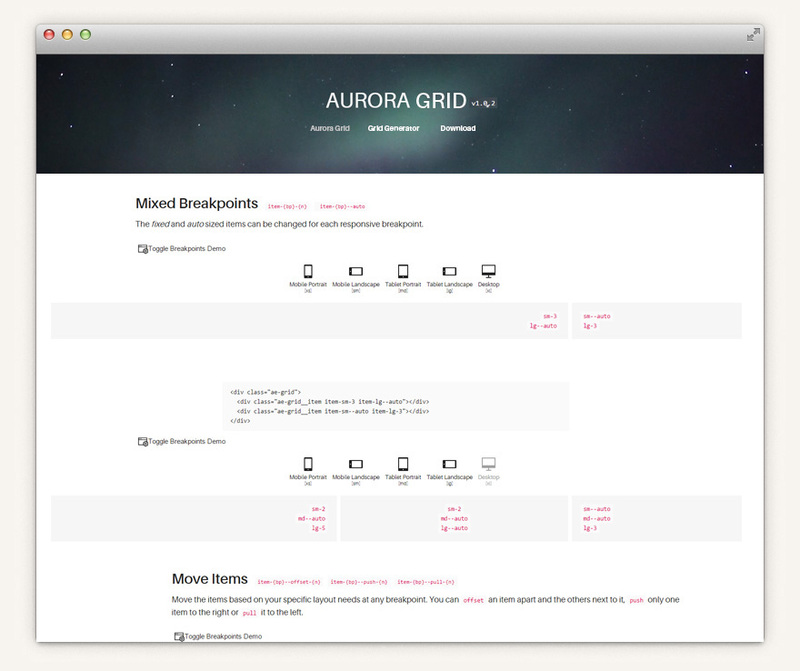 The big idea behind Aurora Grid is to empower our users with all the tools necessary to create beautiful layouts for any devices with a simple and easy to use system. - Added settings and attributes to the Grid Generator tool (Align, Order, Grid direction...). - Added responsive preview and edit on codepen to the tool Grid Generator. Fixed typos in documentation. - Added a missing max-width. We have developped a flexible and responsive grid system with equal, fixed and mixed item sizes to help you easily create modern responsive website and apps. Create custom builds of aurora with SASS settings and functions. Easily modify the different variables to create your own grid system. Visually create any grid layouts in a matter of seconds. This advanced tool lets you setup any type of grid and copy its structure in a clean tidy HTML markup.